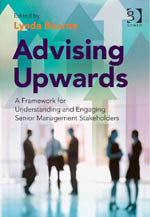 Advising Upwards: A Framework for Understanding and Engaging Senior Management Stakeholders, has been published by Gower Publishing Ltd. The principal focus of this book is on perspectives that will contribute towards an understanding of the critical survival skill of engaging senior managers, and of ‘helping them help you’. Through contributions from researchers and practitioners in related fields the book provides diverse perspectives on the changing world of management and stakeholder relationship management through considerations of culture, group and individual behaviour, organisational management theory and other related subjects. The book defines the fundamental processes and practices needed to support individuals in building and maintain upwards relationships with your important stakeholders. In other countries visit the Gower on-line catalogue or Amazon. I am on my way to the Academy of Management 2011 Annual Meeting in San Antonio, Texas. The focus of my presentation is based on the philosophy of the Quality movement: quality is free! I am developing a line of argument that advocates a proper investment in stakeholder relationship management is more than balanced by the reduction in the failure dollars needed to fix the issues caused by poor stakeholder relationship management. The cost of implementing effective quality and safety procedures is visible and accepted by management, but the result of effective processes is to make the cost of the failures these processes avoided invisible. You cannot measure what did not happen! At the moment, measuring the cost of failed stakeholder management processes is relatively simple; several examples are discussed in the paper. However, management remains reluctant to invest in the solution to achieve similar outcomes to quality and safety. The challenge is cultural. 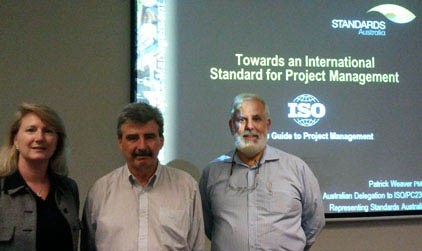 During the PMOZ conference last week, UTS hosted a seminar with the Project Management Institute on the draft ISO 21500: Guide to Project Management. The draft of the Guide has recently been released and the Australian project management profession has been invited to review the content and to make submissions to the Australian Committee managed through Standards Australia. Patrick Weaver, an Australian sub-committee coordinator, gave a presentation on the Guide at UTS to project managers and academics as part of the engagement process with the project management profession. UTS has been represented on the Australian Sub-Committee Working Group by Dr Shankar Sankaran and Chivonne Algeo over the last three years. The infrastructure set up by Australia to participate in the development of the Guide was designed to mirror the structures used by ISO to manage this development. If you would like to review the draft Guide and provide your feedback you will need to contact your national committee. Australin project managers should contact the Australian Committee by going to: www.mb12.org.au, registering on the subscription list and approximately 1-2 days after joining the subscriber list, you will receive an email with detailed instructions on how the consultation process will take place. Comments close on the 19th August. Mosaic has entered into a long term partnership with Meta PM to deliver a series of intensive 4 Day CAPM courses to members of the Swinburne community and others. The courses will be delivered on-campus during semester breaks over the next 18 months. The Meta PM / Swinburne courses are designed to provide Swinburne graduates with access to a range of industry standard credentials to augment their core academic studies and degrees; improving the graduates position in the job market. Mosaic’s role is to deliver the CAPM courses included in the overall agreement. Download the Swinburne Brochure, or see more on Mosaic’s CAPM course options.